Why Marketing Automation Boosts Sales by 220% for Startups & SMBs? The Marketing Automation market is swelling at an incredible pace. Thanks to its affordability and key features of being an enabler and accelerator, now more and more startups and small businesses are signing up to its benefits. Run through these quick FAQs to know just why Marketing Automation is the undisputed armour in a start-up’s kitty. Q. As a start-up founder, I am willing to go for the free-trial, but why would I want to use it thereafter? A. More than two-thirds of the companies that sign up for a free trial of Marketing Automation, end up realizing they should continue using it. Q. How long does it take to see the initial ROI after automating my marketing system? A. Of all the businesses that use marketing automation, nearly 3.75% witness a progressive ROI within the first year. For a startup, this is insane! Moreover, startups can boost their ROI by using marketing automation and stand to gain from prominent features like zigihub’s micro-segmentation which can enhance campaign efficacy by 40-50%. Q. What is the biggest benefit of using marketing automation for my start-up? A. The biggest benefit is “saved time” as reported by most marketers. Marketers have expressed their delight for the amount of time they have been able to save with marketing automation. It is tremendous time….time that can be efficiently utilized in performing other equally important tasks. Q. What would my lead management be like after using it? A. Marketing Automation (MA) automatically captures twice as many leads as companies generate with a basic email system. Q. How does marketing automation help scale up my small business? A. Small businesses using marketing automation outgrow their competitors by 63%, according to a finding by Lenskold Group. A whopping 451% surge in qualified leads have been reported by companies using marketing automation system, as per a Wishpond study. To top it all, startups have seen their sales increase by 220% after using Marketing Automation. That for one, is quite a number! In a nutshell, your start-up or business journey can be best viewed through this flowchart…which points out the role and significance of marketing automation and what it can do for the success of your business. Voila! That is some challenging job! Yes, but there are trusted experts like zigihub who can do this job for you effortlessly with its in-built intelligent algorithms. 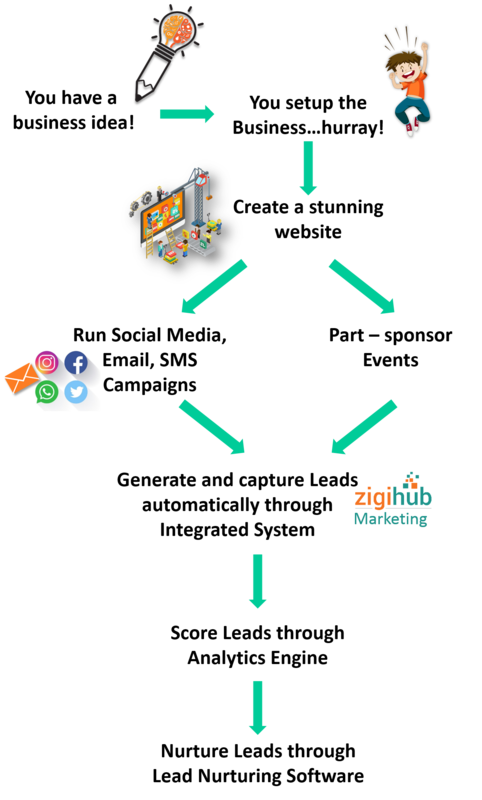 zigihub is a marketing automation platform for businesses and sales and marketing professionals to integrate all their marketing efforts under one umbrella. Using data science and machine learning algorithms, this CRM platform eases the job of marketers and makes the entire process of marketing a cakewalk. For small businesses, marketing automation is full of advantages, as it literally sweeps away a large chunk of time-consuming efforts allowing businesses to scale up faster. Create, run and evaluate campaigns across various channels; micro-segmentation of customers based on behaviour, buying patterns, demographics, etc. for executing targeted campaigns. Triggered responses are generated based on customer-specific personal events like birthday or after payments, subscriptions, signing up for free trials, website visits, etc. Integrated website monitoring system uses intelligent analytics to increase website traffic and lead conversion rate. Integrates various social media channels into your marketing strategy by engaging customers in the digital world, thereby identifying and obtaining a holistic view of your existing customers. zigihub’s social media integration efficiently works towards 360˚ understanding of customer’s social behaviour. It uses fuzzy logic algorithms to match active social media users in the customer base. On-the-fly segmentation of customers and leads to send personalized marketing messages through templates for increasing open rates. For engaging customers, segmented lists are created on the basis of their behaviour, interests and activities for sending personalized messages. Summarizing your customers and creating individual profiles from their specific purchasing patterns, demographics, etc. is known as customer profiling. The Marketing Automation and CRM platform zigihub uses more than 60 algorithms through predictive analytics and machine learning to identify most promising deals and leads. Customers are increasingly looking forward to receiving product recommendations that match their preferences, buying history and likes. Monitoring and evaluating campaigns closely to improve its effectiveness is crucial to the success of any campaign. It includes detailed insights into analytics like opened, read, deleted, etc. Marketing automation platforms are retaining existing customer base with strategic development of their tools in line with the customer’s tastes and preferences. This helps in offering novelty, safeguarding the interests of customers and making them feel valued. These attributes of Marketing Automation work in perfect harmony to drive a start-up engine and help small businesses scale up. So, if you are planning to start your own business or already have a start-up or SMB, you will find all your marketing related synergies being taken care of by Marketing Automation. As most marketers using it say, it is a silver bullet for startups and SMBs.